Why Specify Which Type of Glass? There are a wide range of glasses to choose from to meet the needs of any project. Spandrel glass is one such option. Unlike vision glass, which is meant to be transparent, spandrel glass is designed to be opaque in order to help hide features between the floors of a building, including vents, wires, slab ends and mechanical equipment. To create this effect, the fabrication process for monolithic glass spandrels and insulated glass (IG) spandrels involves applying an opacifier, which is typically made from silicone-based paint or ceramic frits, to the indoor surface of a glass lite. The purpose of this process is to create tinted or colored glass panels that seamlessly blend with the other parts of a building façade. While spandrel glass is available in a wide array of colors, it should be evaluated for thermal stress to determine the level of heat treatment that is needed. "Shadow box" spandrels use a different fabrication process and are constructed with a transparent or tinted lite, backed by an insulated metal sheet or some other form of light-blocking material. 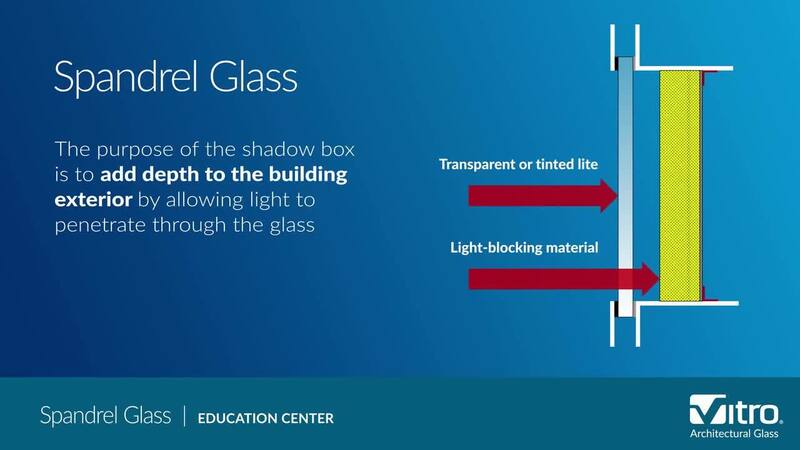 The purpose of a shadow box is to add depth to the building exterior by allowing light to penetrate through the glass, into the façade, while still hiding the building mechanicals. 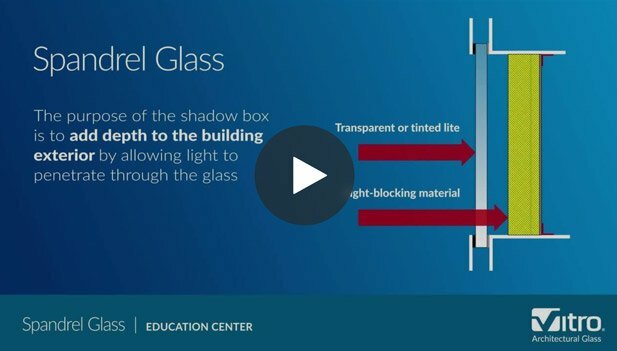 Highly transparent vision glass cannot be perfectly matched with spandrel glass. Color harmonization with spandrels is easier with darker or more reflective tinted glasses. All glass used in a spandrel should be heat-strengthened to resist the thermal stresses associated with potential heat absorption and build-up. Vitro Architectural Glass (formerly PPG glass) recommends placing the opacifier on the fourth surface of the IG to avoid the potential release of vocs inside the IG. If insulation is going to be used with an IG panel, it’s important for the fabricator to ensure that the adhesive and insulation are designed for such a use. Added insulation can trap solar energy inside the spandrel unit, allowing it to build up and increasing the risk for thermal breakage or failure of the adhesive, insulation or other critical components. When using Shadow Box Spandrels, keep in mind that condensation and drying make shadow box spandrels vulnerable to the build-up of unsightly stains, even when a perfect moisture barrier is achieved. Shadow box spandrels can also trap different types of construction debris between the time they're glazed and the time the insulation is installed. And vocs from paint, sealants and other materials can also cause a permanent residue to form on the finished spandrel. Improper installation of backing materials can cause hot spots in shadow box spandrels, leading to potential breakage. By keeping these things in mind, spandrel glass works well as an aesthetic tactic for creating sleek, streamlined buildings. For more technical information about spandrel glass, read Vitro Glass Technical Document TD-145. For any other glass questions, please contact Vitro glass or call 1-855-VTRO-GLS (1-855-887-6457). Vitro Architectural Glass has partnered with ICD High Performance Coatings to offer a full range of colorful, water-based silicone coating options ideal for spandrel, wall-cladding and insulating glass applications. ICD’s AIA course, “ICD 101: High Performance Silicone Coatings for Glass,” reviews high performance silicone coatings on glass for glazing systems in commercial and residential applications including interiors. The course will also review manufacturing, technical codes, applications, specifications and design trends for architectural glazing. Click here to enroll. Resources. Information. Support. 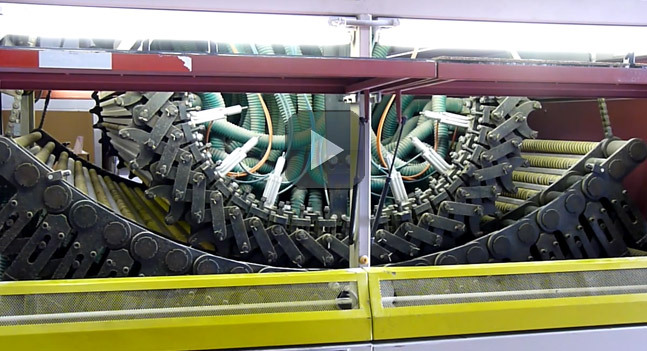 From engaging videos on challenging technical issues to common industry terms, learn more about one of today’s most popular building envelope products. 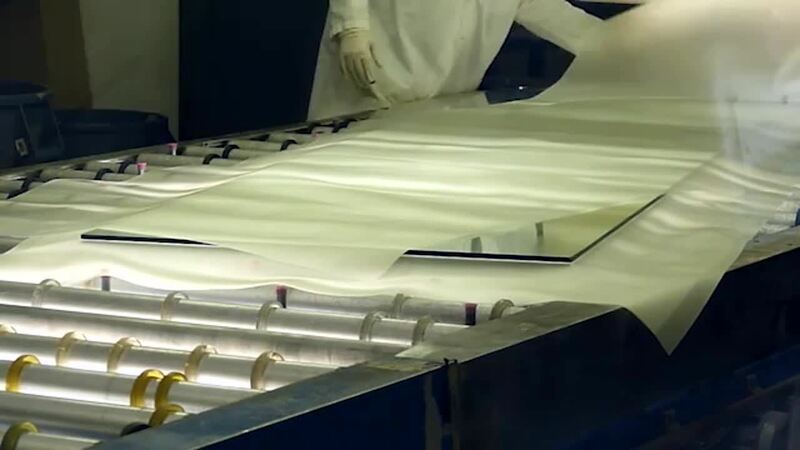 The first insulating glass units were developed in 1945 for the Pullman Car Company in Butler, PA.
A standard float tank can produce glass 24 hours/7 days a week for up to 15 years before it needs to be rebuilt.